I’m still processing the death of my grandmother this weekend, on Saturday night. I haven’t shared any updates anywhere about it online. I’ve gone through several stages of grief, from disbelief to numbness to acceptance and deep sadness. You never know how long you’ll have with some one. Some times, they’re gone in an instant. News of her death was in the Associated Press yesterday, along with local news yesterday. The circumstances of her passing feel at once banal and extraordinary. My grandmother and her longtime partner, Ben, were driving back home from visiting his son and grandchild, just outside of DC. According to state police, around 6:30 PM he hit another vehicle on the Beltway and lost control of their car, hitting the jersey barriers on the right before veering across the road to hit another on the median and come to a stop. Passersby pulled over and quietly committed an act of heroism, pulling them both from the car before it caught fire. I’m grateful to these good Samaritans, who may well have saved Ben’s life and tried to save my grandmother. My sister, thinking of “Mom Mom” this morning, shared an item from the “Fells Pointer,” a publication from the neighborhood that she and my grandfather, Dr. Walter Ray Hepner Jr., moved to in September 1968. My grandmother not only renovated the 18th century townhouse that she, my grandfather, uncles and a troop of Boy Scouts rescued from ruin, in other words, but became a pillar of the early community of preservationists who moved into the then-decayed houses of Fells Point and then fought to protect the entire historic neighborhood when government officials sought to run an expressway through the area. These neighborhoods are now the jewels of the Baltimore of today. While the city still has immense challenges, from poverty to crime to urban blight, the revival that began in the late 1960s and fiercely defended by men and women like my grandmother in the “expressway revolt” will endure for decades to come. Jean Harvey Hepner had just turned 90 as 2014 rolled over. 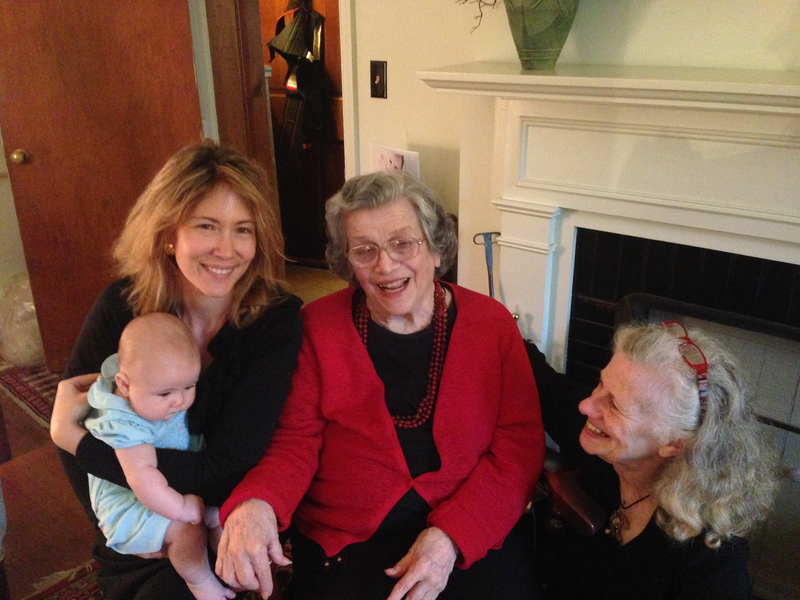 She lived a long, full life, raising 4 children, including my mother, her eldest. She leaves behind dozens of grieving family members and friends, including this eldest grandchild who is grateful for last Christmas, when Mom Mom was able to meet and connect with Allegra, her first great-grandchild, and the six weeks in the summer of 2005 when I stayed with her in Fells Point, finishing renovations that my grandfather had begun in the 1980s. Today, I’m remembering nearly 4 decades of my life with her, from the wonders of Boxing Day to the fun of egg hunts on Easter to halcyon summer days on the coast of Maine. I’m glad that we had the time to visit the Robert Long House in Fells Point and walk around the beautiful garden that she had painstakingly, methodically researched and planted with the flowering plants and herbs that would have been present in colonial Baltimore, when the house was originally built. My grandmother knew an enormous amount about plants, a passion and knowledge base that she passed on to her children over the decades, along with any number of other things. One of the most precious gifts she ever gave me was a perfect Meyer lemon from the tree that resided in her sunny drawing room on Fell Street. I made one of the best lemon-butter sauces of my life with that fruit, and reserved the zest from the skin for many deserts and dishes to come to boot. My grandmother would have approved of that thorough use. As a child who came to age during the Depression, she reserved, preserved and even hoarded all kinds of things, from string to hardware to any number of baskets, button and doodads that I found fascinating as a child. I still have an index card, somewhere, inscribed with her simple, spectacular recipe for Maryland crab cakes, although I stopped needing to consult it long ago: some skills, once your grandmother teaches you to do them, become engraved in your memory for lifetime. I miss you so much already, Mom Mom.